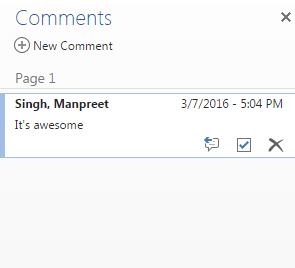 Welcome to an article on ‘How to comment on Word Documents in a document library in Office 365 & SharePoint 2013’. This is a new feature where you can provide comments on the documents in a SharePoint library to show your views about it. It’s like when you do commenting on the Word file while building the document, you can do the review right away on the library and save it. Let’s see how a user can comment on a word file through the library. Upload a word file to a document library. Click on the document to open the Word file. You will see the Comments option on the right corner of the document. Click on the icon as shown by the arrow. The comments dialog box will open as the screen below. Once you post the comment, a small symbol of comment will appear on the document as per the screen below. When you or an external user clicks on it they will see your comments as below. Under the Comments dialog box, you can either comment on it or you can click it as done or delete it the same as we do while building our documents with review comments. But this is so easy and available right at your library. You don’t have to download, give the review and then upload thereby saving time and effort. Here was an article on ‘How to comment on Word Documents in a document library in Office 365 & SharePoint 2013. Watch out for more articles, until then keep learning.